Energy Crops like corn, Sudan grass, maize, millet, white sweet clover etc. Yard or garden waste like leaves, plants, vegetables, branches and tree trimmings, grass clippings etc. Source Separated organics (SSO) like fruit and vegetable waste, food waste, coffee and tea filters and other organic leftovers. Anaerobic digestion feedstocks can vary widely based on their organic fraction, water content and biodegradability. Usually, it is expected that organic content of the feedstocks should be in the range of 70% - 95% of the dry matter content. In general, feedstocks with less than 60% dry matter organic content are considered not so worthwhile for anaerobic digestion. The nutrient ratio, specially the Carbon to Nitrogen Ratio (C:N) is very important for the microbes in biodegradation process. The ideal carbon to nitrogen (C:N) ratio for anaerobic digestion ranges from approximately 20:1 to 30:1 (AgSTAR/US EPA). The optimum carbon, nitrogen and phosphorus (C:N:P) ratio for anaerobic digestion has been reported to be 100:5:1 (Feedstocks for Anaerobic Digestion, Steffen’s et al., 1998; www.adnett.org/dl_feedstocks.pdf). The water content of feedstocks is also very important for anaerobic digestion. 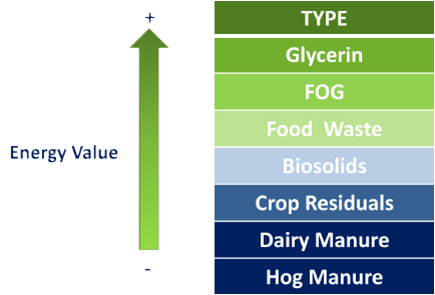 The high water content feedstocks require higher digester volume and higher heat input; thus increase the process cost. On the other hand, a higher solid content feedstock has mixing issue, solid settling issue as well as clogging and scum layer formation. That is why the optimum total solid concentration for a completely mixed anaerobic digester is suggested in the range of 6 to10% (Feedstocks for Anaerobic Digestion, Steffen’s et al., 1998; www.adnett.org/dl_feedstocks.pdf). Different feedstocks have different methane production potential or different energy recovery value in anaerobic digestion. 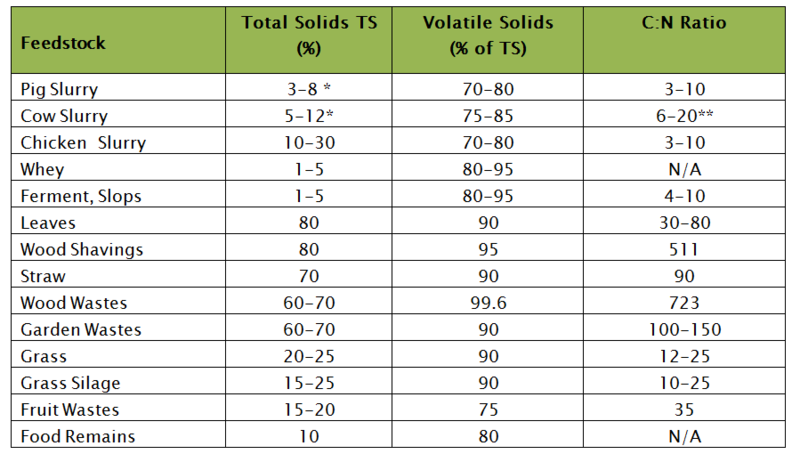 In addition, process selection, reactor design and operation are also done based on input feedstocks’ characteristics. Moreover, quantity and quality of end product and process economics are also functions of feedstock characteristics. That is why feedstock selection and optimum feedstock mix are crucial for anaerobic digestion process design. Anaerobic digestion process was originally designed for manures and sewage sludge. But these two feedstocks do not have much energy value left as they have already gone through some digestion inside the animal’s body. In general, the feedstock of high organic content that is easily degradable by anaerobic bacteria are considered good feedstock for anaerobic digestion; such as food and food processing waste, fats, oil and grease etc. Some energy crops also have high level of biogas production potential such as corn, maize and grass silage. On the other hand poor candidates for anaerobic digestion are yard waste, woody waste etc. as most anaerobes are unable to degrade lignin, the major fraction of these wastes.